Home / For Visitors / 2018 Exhibitor List / JUMBO APPLIED ENGINEERING CO., LTD.
JumboLaser in Tainan, Taiwan, focus on laser processing applications, including cutting, welding, cleaning, engraving, marking, etc., combined with intelligent modules, automation system integration, and robot to enhance production efficiency. 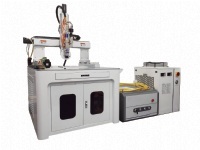 JumboLaser provides processing applications for fiber laser, CO2 laser, and UV laser. Provide equipment sales, proofing testing, OEM services, equipment rental, automation integration, education training, maintenance warranty, technical support, etc.